The testo 625 is an ideal entry level instrument for IAQ and IEQ measurements of temperature and humidity. Use it to monitor hard-to reach points in AC and heating system ducts, environmental changes in remote rooms or storage areas, anywhere you need to be two places at the same time or only have one hand free to work. 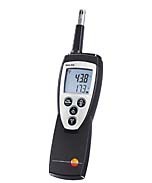 The testo 625 temp/RH probe can be used three ways: either attached to the instruments as shown, or connected via a cable or mounted on an optional wireless handle. The clear back-lit display can be switched between relative humidity, wet bulb, and dew point at the touch of a button. Upgradable to wireless with a wireless upgrade kit if desired at a later time. 246 TruReward$ points will be placed in your account when you buy this item.